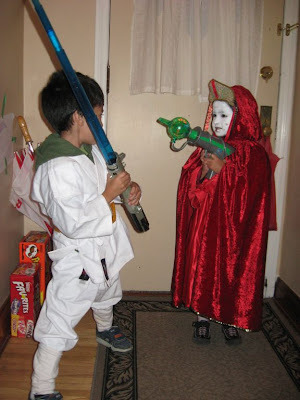 ... two awesomely cute children decided to dress up as Luke Skywalker and Queen Amidala and use the Force -- and their irresistible powers of Cute -- to acquire mounds and mounds treats. What do you think of my young Skywalker and his Queen mother? Click on the pic for a better look. Pretty good, non?! I'd say this was probably the best Halloween yet for us. It didn't snow, but there was a chill in the air. Luckily, there was enough room under the costumes for extra warm clothes. I put more effort in their outfits this year, and it definitely paid off. The kids LOVED their costumes. And Roomie said that many who saw them were full of compliments -- makes me wish I'd been the one to accompany the kids on their hunt just to hear them! While Roomie took the kids around, I gave the candies out. We had 24 kids come to the door, which is about average. Most of the kids stick to the next block over and rarely venture this way. But it's getting better. My brood started their hunt at around 7pm and were done after just over an hour. The kids brought in a respectable haul. I did the candy inspection, removing the peanut products from Mini's pile. Those treats she traded with her brother for his non-peanut treats, and all transactions were completed with little trouble. Treats of questionable and unknown origin were discarded outright. Daddy ended up with most treats neither kids wanted. All in all, another Halloween successfully enjoyed and completed! OMG - I love the kids costumes!!! As a big Star Wars fanatic myself, I give ya massive props!! I love Mini's costume - she looks too cool! Can you make me a Queen Amidala costume next year, Nen??? Those costumes ROCK! And I've always wanted to be Amidala. She's so pretty. You did a really grand job! I had music playing, spider webs, fog machines, thunder & lightening machines, a graveyard, flying ghosts and not one trick or treater. :( I was so bummed. So I danced in my front yard to Monster Mash & Thriller! Those are really awesome costumes! I like that they were a matched set, too.